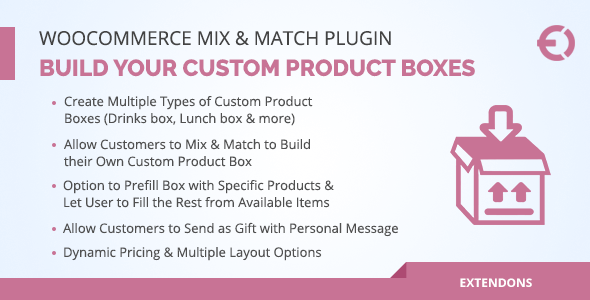 WooCommerce mix & match plugin lets you create multiple custom product boxes and allow customers to build their gift packs by picking their own choice of products. You can create product boxes of various products such as lunch, sweats, drinks, etc. Enables dynamic pricing for product boxes i.e fixed, per product price with or without base cost. Option to prefill box with specific products & let User fill the rest from available items. It also enables multiple layouts for custom product boxes, so you can choose any layout which suits your website. You can also allow customers to attach a personal note with the gift pack. It enables dynamic pricing options for mix and match products. You can set either fixed price, per product price with or without base price for product boxes. WooCommerce mix and match products plugin lets you add simple products or product’s variant in a bundle. It enables multiple layout options to display boxed products on your website. You can choose any layout which suits best for your online store. Rather than selling full box, you can allow customers to buy a partially filled box as well. WooCommerce mix and match plugin also enable you to sell pre-filled boxes on your e-store. You can add specific products in this box and allow customers to fill the rest of the box from available items. You can allow your customers to send packs to their loved ones as a gift and personal message.